Turns standard 3-1/2 - 5 gallon buckets into comfortable seat. Grooved design channels away moisture. Durable lightweight plastic. Newly redesigned and engineered to satisfy virtually any storage need. Top organizers enable small parts organization. Latch with geometric lock for smooth and easy use. New elegant design with sturdy robust appeal. Pad eye lock, enables to lock the toolbox. Top recesses for screws and washers. Tool tray with handle and enabled side access for flexible storage solutions. All steel construction. Riveted bracket for added structural strength and featuring flared nail holes for quick and easy disassembling. For use with standard 2x4's. Black enamel finish. Two lid organizers for small parts storage - accessible without opening the tool box; built-in pad lock eye for small locks - keeps contents secure; soft, wide rubber coated handle allows for easy and comfortable grip; tote tray inside to store smaller items. Innovative locking latches and carriage of 3 at once saves time; stacking option allows secured stacking of several organizers to save space and maintain organization; removable dividers provide high customization for small parts and larger hand tools; unique 90 degree angle in the main compartment design allows storage of hammers and angled tools or tape measures comfortably together with the small parts in the other nearby compartments; special lid structure - upper lid interlocking with dividers - prevents movement of small parts from one compartment to another. DeWalt Magnetic Tray Innovative locking latches and carriage of 3 at once saves time; stacking option allows secured stacking of several organizers to save space and maintain organization; removable dividers provide high customization for small parts and larger hand tools; unique 90 degree angle in the main compartment design allows storage of hammers and angled tools or tape measures comfortably together with the small parts in the other nearby compartments; special lid structure - upper lid interlocking with dividers - prevents movement of small parts from one compartment to another. Two lid organizers for small parts storage - accessible without opening the tool box; built-in pad lock eye for small locks helps keep contents secure; tote tray. Features removable dividers for inner customization; carry handle for easy portability; unique lid design keeps small parts from moving between compartments. Heavy duty transparent polycarbonate lid and side latches enable stacking to other PRO organizers. Two lid organizers for small parts storage - accessible without opening the tool box; built-in pad lock eye for small locks - keeps contents secure; soft, wide rubber coated handle allows for easy and comfortable grip; nickel metal-plated latches; tote tray inside to store smaller items. Newly redesigned and engineered to satisfy virtually any storage need. Top organizers enable small parts organization. Latch with geometric lock for smooth and easy use. New elegant design with sturdy robust appeal. Pad eye lock, enables to lock the toolbox. Top recesses for screws and washers. Tool tray with handle and enabled side access for flexible storage solutions. One hand operation latch allows opening when other hand is occupied; innovative design with robust structure and large volume; extra-wide soft grip handle for easy lifting; removable tray allows enough space for larger tools to be stored underneath; organizers on top lid for small parts organization. 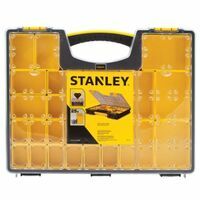 Simple shape and proportions for easy access to both hand and power tools; two lid organizers accessible without opening the toolbox for small parts storage; removable lid with side latches for easy connecting and detaching. 12 oz. Duckwear canvas dividers for easy compression of pockets; reinforced poly ripstop pockets and bottom; 19 pockets: 13 exterior, 6 interior; you can stack 3-4 of the parachute bags into a 5 gallon bucket; rip cord closure. Size: 10" D, 6.5" H.